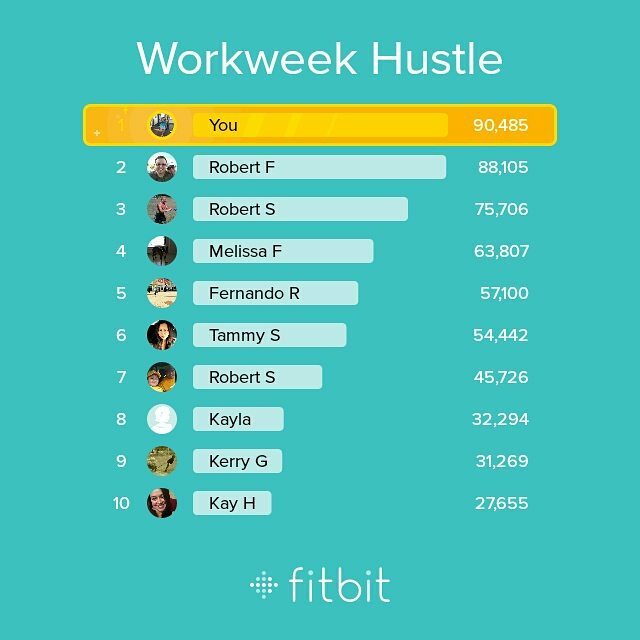 Last Friday, the only thing I did after my trail run and my kettlebell AMRAP workout was walking and do the stairs in the parking garage at work. So, nothing new to report in this post from last Friday. So, we’ll just start from Saturday like I do when I’m posting these on the regular day. • Saturday: I had planned to do a short, 3 mile run in the morning after I got done working overtime on the night shift at 6am to help me stay awake long enough to get my oil changed at 8am, however I was so tired since I had gotten up at 6:15am Friday morning, I set my alarms and took an hour nap instead. I had also planned to do the gym in the evening, but that didn’t happen either. I just decided it would be a rest day. 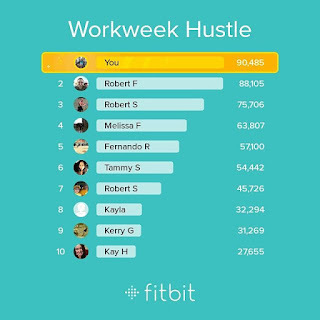 FitBit notified me that I had won the Workweek Hustle...YAY! 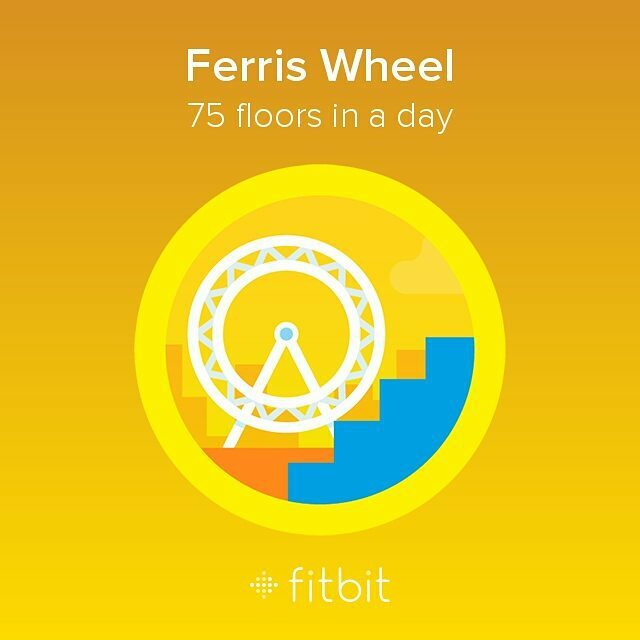 To get my 10,000+ steps in this day, I did walk around my apartment complex and then up and down ALL THE STAIRS to all the buildings (14 total, so 28 sets of stairs for 54 floors of stairs), plus a couple extra floors of stairs to hit 75+ floors for the day and earn me the FitBit Ferris Wheel badge! • Sunday: went for my weekly bike ride. I just decided that I loved last week’s super hilly 18-ish miles so much that I wanted to do them again, so that’s what I did! 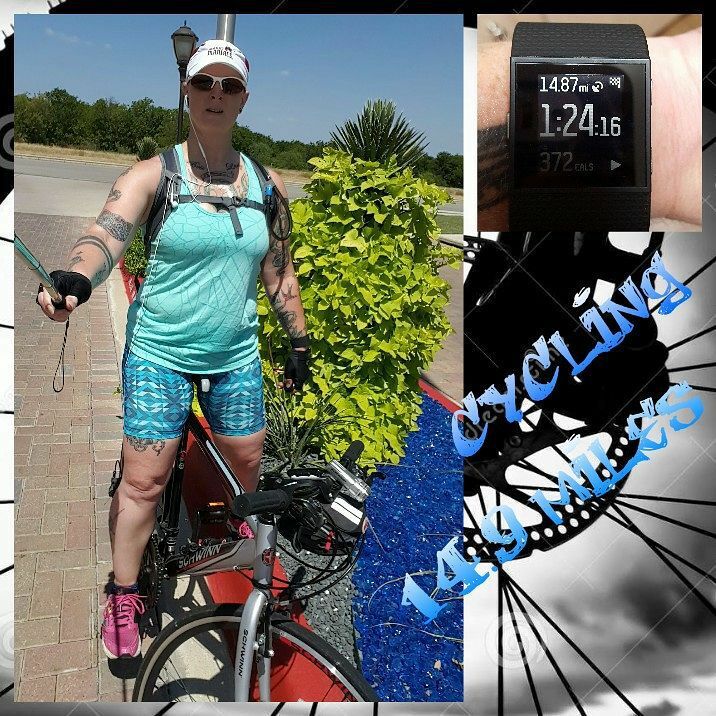 Well, sort of…I did most of that route, but my foot was hurting really bad and time was running short (so much to do since I had plans with a friend to watch a movie at her place and then get all my stuff done before going in to work overtime on the night shift again), so I only rode 14.9 miles. It was still a great ride, even if it was shorter than I had originally planned to ride. • Monday: no workout. Worked overtime on the night shift Sunday night, so just sleeping and my garage walks this day. 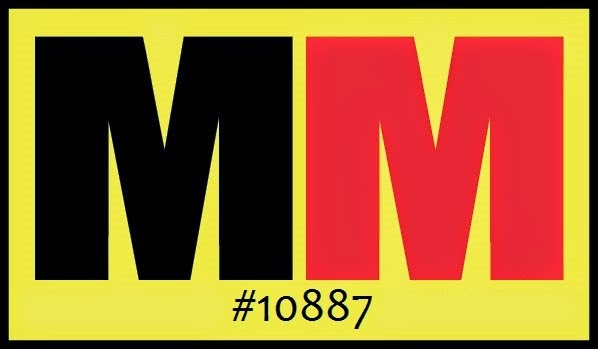 • Tuesday: A couple months ago, I found out about a virtual race for the National Park Foundation’s 99th birthday. However, I missed the cutoff to register for it. 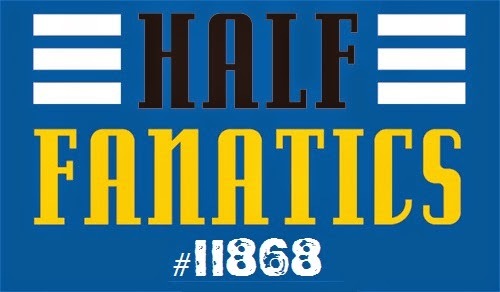 I got an email from the virtual race company putting the race on that said they had apparently opened registration back up and I could register for it. So I did! Anyway, the National Park Foundation’s birthday is today. I signed up to run it as a 5K. However…ugh…I hate to type “however” in these posts…however, I was exhausted and then had a hard time sleeping because my apartment complex replaced this light between my building and the next and now it’s practically daylight in the middle of the night the damn this is so bright. So I didn’t get up in time to do it as a run. 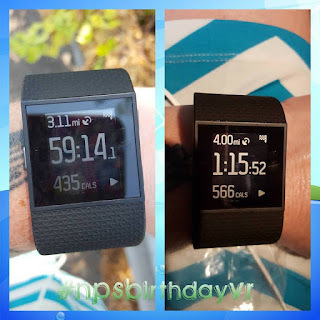 Instead, I parked about 30 minutes early for my therapy appointment and walked it as a 5K, plus an extra .9 of a mile for a total of 4 miles walked. As I was finishing up my walk, I was walking down this hill. An SUV was pulling up to the curb and I was paying attention to that and not where I was walking. Then a curb appeared out of nowhere and I stepped off it, but because I didn’t see it, I stepped ALL WRONG and rolled the hell out of my ankle. It hurt so bad. So I sat down and after a couple minutes it felt a little better so I finished up the last 1/3 of a mile of my walk and took some ibuprofen. • Wednesday: nothing. Went to one of those private ERs and had x-rays done of my foot and ankle to make sure I didn’t break or tear anything. The doc said it was just soft tissue inflammation…aka: sprained ankle. • Thursday: I wish I could say I worked out, but I didn’t. I went to my regular doctor instead as a follow up to the ER visit. He put me in a boot and on restricted duty at work for at least 2 weeks. He did say I could swim and use the stationary bike…but I’m not so sure about the stationary bike. • Friday: I hate being “broken.” I did finally take advantage of that free initiation and 1 month free that 24 HR Fitness had offered me and signed up there! I can’t cancel my Planet Fitness membership until September 18th or I’ll have to pay an early termination fee. Boo! So, one more month of dues to them. But, now that I have a membership at 24 again, I can start swimming a few times a week (while I’m recouping from the sprain). They also have a hand cycle I can use for cardio. As far as strength training goes, in addition to a plethora of upper body and ab machines, they also have a TRX training area and I love TRX training! OMG! OMG! OMG! OMG! Are you serious right now? I lost 3.5 pounds this week? And almost an entire % of body fat? How is this possible? 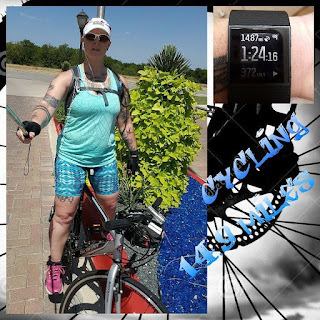 I didn't exercise half the week (didn't hit my step goal the last 3 days either...not even close to it) and the other half of the week I just sort of half-assed my workouts (except for the bike ride, that was a good one). I'm so beyond happy right now. 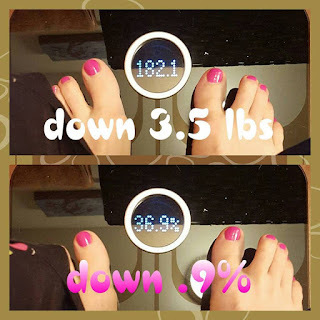 I was slightly afraid, yet prepared, to see zero lost when I stepped on the scale this morning. I am shocked and super happy with this week's results! Just 12.1 pounds to go until I hit my GOAL weight!!! You’ll notice that I am posting the body fat % from the Aria scale and am no longer using the Omron. Like I said last week, I won’t be using it anymore. The number on the Aria readout is higher than the Omron was telling me, but honestly, I didn’t really believe the Omron. I just liked what it told me…even though I knew it was most likely just lies. Why is that? Well, a couple years ago, I had the trainer at my gym calculate my body fat with calipers and she calculated 36%. Now, take into consideration that I 1) weighed less than I do now, 2) had been working out just as consistently as I am now but for a longer period of time, and 3) was just generally fitter than I am at this moment (but I AM getting there again, don’t worry!). Take all of that into consideration and then look at where I’m at right now and the number on the Aria doesn’t seem so farfetched anymore. Which is why when I saw the 37.8% on the readout last week I wasn’t even remotely upset by it. I just took it in stride and accepted it. I’m in a much better place than I was a few weeks ago when I had that meltdown, that’s for sure. I’m mentally in a much better place since having that meltdown and then starting up this new way of eating. My therapist even said that I’m handling this really well. He said that because when he asked me about what am I going to do when (not if) it comes to a point where I’m feeling stressed about how I’m eating and how (at least for right now) I’m not allowing myself any cheat days or meals or treats and I start getting urges to binge or eat junk food, my response was that I am just going to keep myself aware that it WILL happen so that I will not be caught off guard when it happens. I also said that when it happens, I’ll allow myself a cheat meal and then get back on track after that. For instance, I can go get a stack of pancakes, no butter, with sugar free syrup, and maybe a couple slices of bacon as well. Perfecto! This was my 3rd week with eating 1300-ish calories per day. I’d say I’m getting used to this and I am really liking it. Last week and the week before, I had fish tacos for lunch every work day because they were cheap, easy, fast and convenient to make and I didn’t have much time for food prep for last week. Needless to say, last Friday (even though they really were still delicious) I was so tired of eating them that I seriously had to choke them down. Last Saturday I went to Sam’s Club to buy a couple sides of salmon so that I could make salmon jerky for this week’s lunches. However, apparently Sam’s Club doesn’t sell those sides of salmon anymore because they were nowhere to be found. Ugh. So, I had to go with plan B…which was…drumroll please…STEAK! Yep, steak. This had been my plan for lunches next week, so it just got moved up a week. They had a 5-pack of bottom round steaks…4.75 lbs! I used this seasoning recipe from the Fast Metabolism Diet for their broiled steak and asparagus wraps, wrapped them up in foil and broiled them for 23 minutes. Then I cut them up and portioned them out evenly for 5 days. At first I was a little skeptical that since the steaks were so big (about 15oz pre-broil and 13oz post-broil) that they would be too many calories and that I would have to portion it out into 6 or 7 or so different portions, but it came out just right when I changed up my dinner from a large apple to a salad of baby romaine with super low calorie yogurt dressing.